Be the first to share your favorite memory, photo or story of Margarida. This memorial page is dedicated for family, friends and future generations to celebrate the life of their loved one. 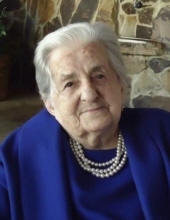 Margarida (nee Linhares) Ferreira, 96, passed away peacefully, at her home in Newark, on Tuesday, December 4, 2018, with her loving family by her side. She was born in Povoacao, Sao Miguel, Acores and came to the United States in 1989 and resided in the Ironbound Section of Newark. Back in the Acores, Margarida was a fabulous baker, specializing in breads and cookies. Wife of the late Jose Cabral Rodrigues; devoted and loving mother of Honorato Rodrigues and his wife Rosario of Acores, Avelino Rodrigues and his wife Fatima, Daniel Rodrigues and his wife Gorette of Canada, Judite Fagundo and her husband Francisco and the late Jose Carlos Rodrigues; dear mother-in-law of Felismina Rodrigues of Canada; also survived by 14 grandchildren, 28 great-grandchildren, 1 great-great-child and many nieces and nephews. The Funeral for Margarida will be on Saturday, December 8, 2018 at 8:30 am at Buyus Funeral Home at 426 Lafayette Street, Newark, NJ. Thence to Our Lady of Fatima Church, Newark, where at 9:30 am the Funeral Mass will be offered. Interment to follow at Holy Cross Cemetery, North Arlington, NJ. Relatives and friends are welcome to attend. The visitation for Margarida will be on Friday, December 7th from 5 – 8 pm. To send flowers or a remembrance gift to the family of Margarida L. Ferreira, please visit our Tribute Store. "Email Address" would like to share the life celebration of Margarida L. Ferreira. Click on the "link" to go to share a favorite memory or leave a condolence message for the family.